You are currently browsing articles tagged coal. 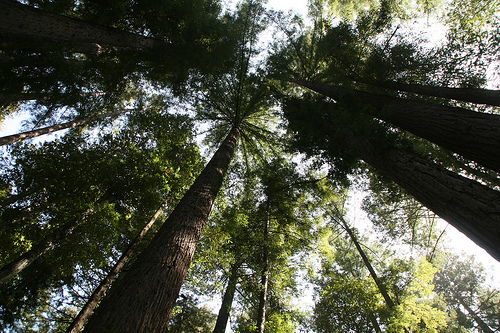 Why do mature redwood trees have trunks that rise two hundred feet before branches commence, live for centuries and have bark that’s a foot thick? Because they are adapted to fire. 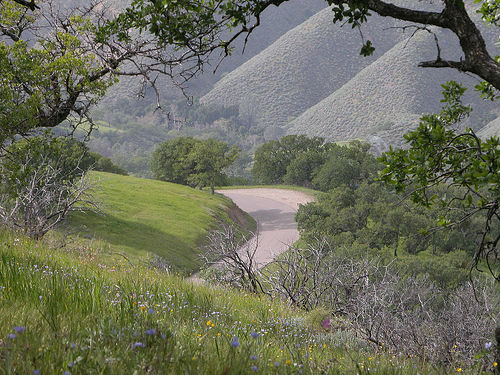 Why does the silver-green chaparral that covers California’s hills and mountains burn so easily? Because it’s supposed to. 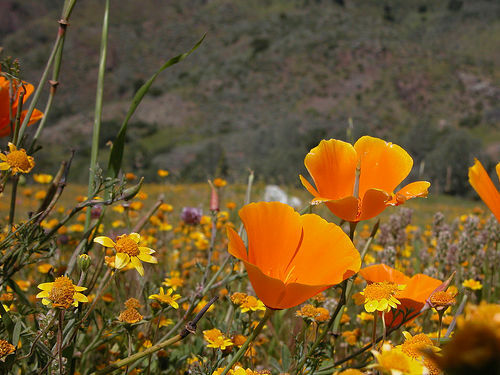 Why, other than its color, is the California Poppy such an appropriate flower for the Golden State? Because it is adapted to both fire and earthquakes. Says Wikipedia, “It grows well in disturbed areas and often recolonizes after fires”. Of course, so do we. That’s why it’s not weird to find humans colonizing hillsides and other “disturbed areas” of California. Case in point: I am writing this in a house sited on an former landslide, not far from the perimeters of two wildfires that claimed hundreds of other houses in the past few months. Every spot on Earth is temporary, but California is a special example. As permanence goes, California is a house of cards. For example, take a look at some of the animations here, prepared by geologists at UCSB. Watch as a sheet of crust the size of a continent gets shoved under the western edge of North America. Debris that piled up in the trench where that happened is what we now call the Bay Area. Submerged crust that melted, rose and hardened under North America — and was just recently exposed — we now call the Sierras. Take a look at the last 20 million years of Southern California history. It’s a wreck that’s still going on. One section of that wreck is a bend along the boundary between plates of crust. Mountains pile up along that bend, like snow in front of a plow. The biggest of these ranges we call the San Gabriels. Those are on fire right now. Add up all the Southern California wildfires over the last twenty years and you’ll get a territory exceeding that of several smaller states. My point is perspective. The human one is so brief that it can hardly take in the full scope of What’s Going On, or what our lives contribute to it. In a geological context, what we contribute are carbon and fossils. We do that by dying. Other planets have geologies as well, but none have marble, limestone, coal or oil. Those are all produced by dead plants and animals. It would be hard to make heat on Mars because — as far as we know — there is no dead stuff to burn. Humans love to make structures and produce heat, which means we have an unusually strong appetite for dead stuff. Even cement and steel require dead stuff in their making. Nothing wrong with that, of course, unless you’re not human. From any scope wider than our own, we are a pestilential species. Since the human diaspora began spreading out of Africa only a few thousand generations ago, we have chewed our way through land and species at a rate without equal in the history of the Earth, which began 4.567 billion years ago, or more than a third of the way back to the start of the Universe. We are distinguished by our intelligence, our powers of speech and expression, our ability to use tools and to build things, our ability to learn and teach, and our diversity (no two of us, even twins, are exactly alike). There are 6.781 billion of us now. Few of us will live more than a hundred years, and fewer still will have more than a few decades to contribute more than carbon to the world. Among the many recent developments in civilization, two stand out. One is a widespread realization that the effects of human activity on the planet are non-trivial. The other is a growing ability to connect with each other and communicate over any distance at very little cost. What will we do with this knowledge, and the ability to share it? Will we follow the model of civilizations that waste the places where they live? Or will we prove to be creatures who can change their nature and stop doing that? The former is the way to bet. The latter is the way to go. Bonus read: John McPhee’s The Control of Nature. A third of it is called “Los Angeles vs. The San Gabriel Mountains.” While it is mostly about “debris flows” — slow motion landslides — that happen during winter rains, the important part for today’s discussion involves a primary condition for those flows: mountain slopes denuded of vegetation by fires. This means you can count on many mudslides this coming winter. 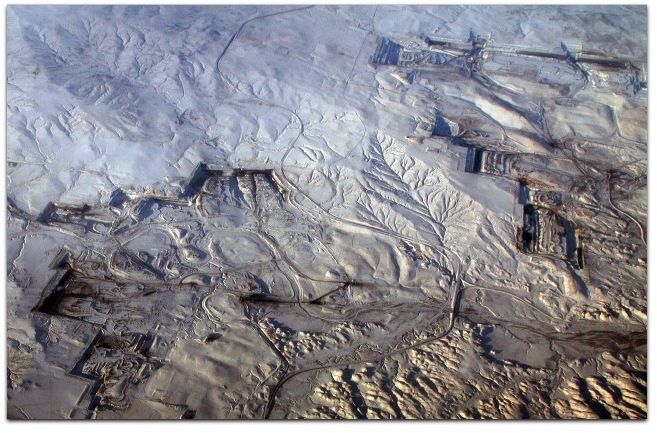 Arch had sales volume of 99 million tons of coal in 2007 in the southern Powder River Basin in Wyoming, the nation’s largest coal-supply region. This tonnage is produced at Thunder Basin’s Black Thunder and Coal Creek mines. Arch controls approximately 1.75 billion tons of reserves in the PRB. I also shot Coal Creek, which is on the other side of another huge mine, Jacobs Ranch. Got many shots of that one too. In fact, I have all these shots in RAW, in case anybody wants a high-quality copy.